I used to measure spring by the appearance of the first tiny leaves. They came forth less as individual slices of color than as a pale green mist among the overgrown thickets that overhung the long, steep driveway of my suburban childhood home. Our modest neighborhood of one-acre, steeply-sloped lots was carved out of a hilly woodland in an era when apparently, people liked trees–and the privacy that came with them. Once summer came, the foliage closed in around us like a verdant bubble, and the surrounding houses disappeared. There were probably lots of kids nearby, but unless we met at school, I never knew they existed. The two or three of us who were classmates rode bikes on the sleepy dead-end streets and built tree forts in forested yards. But we were in no real sense a community. Five years ago, my husband Hal and I bought a 100-year old house in one of Nashville’s Victorian-era streetcar suburbs. It was, and still is, a lively and chaotic place, with sidewalks and front porches, nearby restaurants and shops, and lots and lots of neighbors in plain view. We moved in during a December of record lows–temperatures below 10 degrees, and even an early snow. That first winter seemed as isolated as summers in Mom and Dad’s pocket of semi-rural suburbia, but without the pretty colors. We hibernated in our then rundown, new-old house, slowly transforming it into something habitable. At first, it seemed small, cold, and unfriendly. The only notable sign of life was a huge possum that clawed its way up and down the walls every night like something out of Alien vs. Predator. Sometime in March, the neighborhood seemed to yawn, stretch, and stagger outside, blinking sleepily in the sunlight. As the days warmed, people we’d never seen emerged onto sunny front porches to sit and chat awhile. The sidewalks became mini highways bearing morning dog walkers and moms pushing baby carriages. 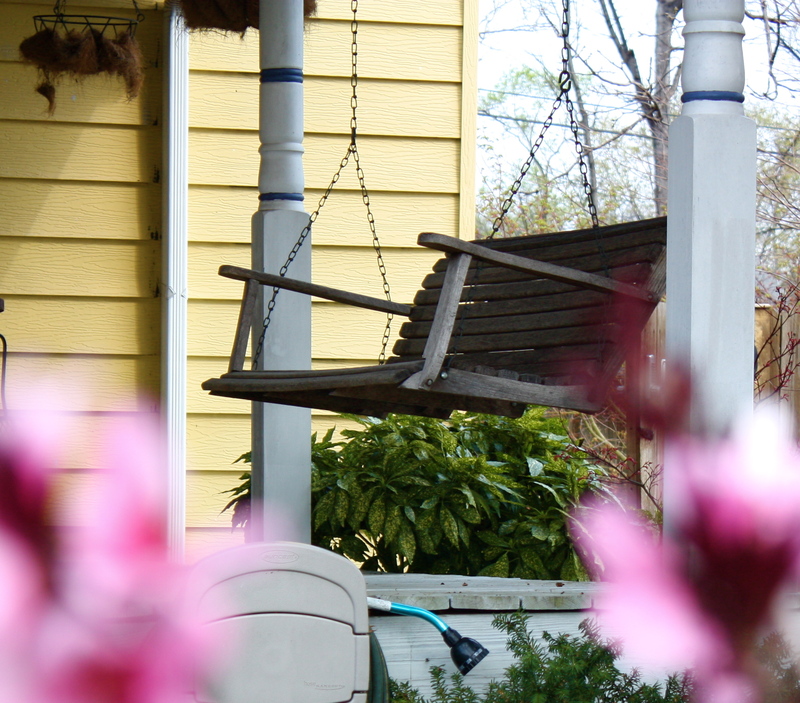 We discovered our own front porch that spring and found that a couple of empty chairs and a swing could fill quickly if beverages were available. Passing faces became familiar, smiles and waves frequent, and extended front-stoop visits more so. That summer and those that have followed, we’ve come to know the people who live near us, thanks to these front-porch moments. When a neighbor has an extended illness, a death in the family, a wedding, a birth, or any major change of fortunes, we know it. We see the celebrations and the extended absences, and they notice ours. And then there are the small gifts that greet us some mornings upon opening the front door: a freshly baked pie from Mrs. Young across the street, or the New York Times from Robert on Sunday mornings. It’s like we’re all sitting together in one big outdoor living room we share. I still watch avidly for the first green shoots to poke out of the ground in March, for pioneering daffodils and cherry blossoms. 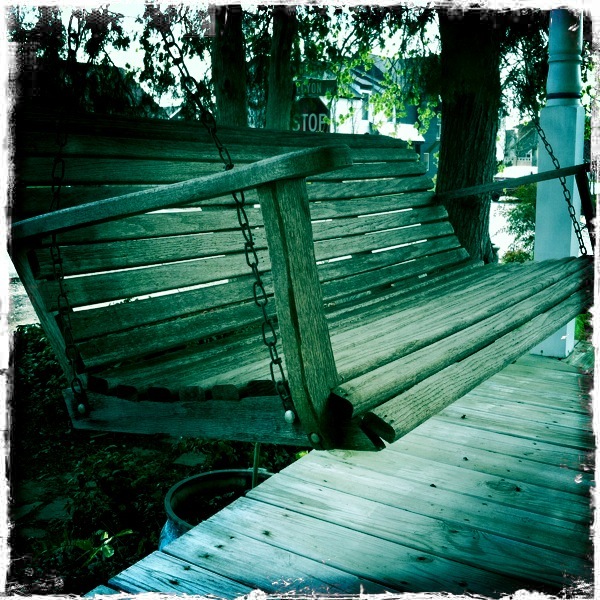 But for me, spring comes to Halcyon Avenue a little earlier–when the first human emerges from hibernation, and the first sun-warmed porch swing finally rocks into life again, propelled by laughter and human exertion, rather than the lonely push of a winter wind. This essay first appeared in Tennessee Home & Farm, Spring 2006. I don’t find it sad at all! We all have to find beauty however we can.